I’m back! I’m drowning in homework and I don’t how long it will be before I post anything else, but I promise I’ll try as hard as I can. Another problem is that I’m in a reading slump and this is a book blog, soo you know I need to read books. By the way I’m also doing other projects: I have an art instragram @arvenig_art and soundcloud @arvenig. So if you like art or music please check them out! It’s been raining all day here, so I decided to procrastinate with my homework and read this cute and heart-warming graphic novel by the lovely author Debbie Tung! PLOT: Bookworms rejoice! 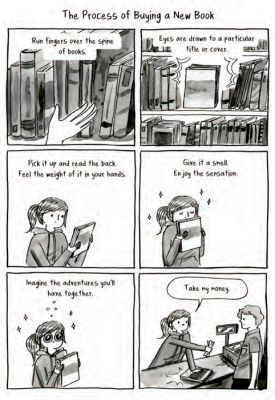 These charming comics capture exactly what it feels like to be head-over-heels for hardcovers. I was browsing some books on Netgalley and as soon as I saw this book I recognized the author’s style and immediately downloaded it! This book is an adorable collection of comics about book lovers: our daily struggles, moments of joy, bad habits, etc. It also features some great book recommendations, advice for reading slumps and a list of things book can teach all of us. Debbie Tung is an illustrator and also author of the book “Quiet Girl in a Noisy World”. I know her from her instagram @wheresmybubble where she posts short, funny and lovely comic-illustrations about her everyday life. I literally devoured this book while sipping a cup of tea in this cozy and rainy day. As a book lover I related to all of the scenarios illustrated and literally smiled the whole time while reading this adorable book. The illustrations have a very recognizable style that I love even if I expected the comics to be more “tidy and neat” for the book. This is the most adorable comic book for book lovers! I loved it and I’ll definitely buy the physical copy! I also think that this would be the perfect gift for all of your friends that love books! Great review 😀 I love this book <3 it was so cute!